I realize that you may find it odd to post about teeth on a baking blog but when you stop to consider you surely will realize that when it comes to appreciation of eating, there is little more important. My mother certainly drove this impression home because she was my first and long-time dentist. In the 1930's, there were very few women in this profession, in fact, she was the only one in her entire dental school. She had been inspired by her aunt Beck who came to New York from Russia with her older brother Saul, both of whom then earned money to bring over the rest of the family. (Beck became a dentist and Sol became the youngest chief of pediatrics at Mount Sinai hospital.) My mother often reminded me when I was young that my teeth were pearls and that it would be great blessing to have full possession of them one day when I would be old. Of course I had no interest in this message and resisted the four glasses of daily milk she forced upon me. Now I am grateful. I'm also grateful that she married a man who at thirty did not have a single filling. (Between the milk and that man I have very strong bones and teeth.) As a child It was not a pleasant experience to have my mother work on my teeth but as I got older I realized the virtue of having a dentist who had so much integrity, loved her profession, and also loved me. When she retired, her mission was to find me a replacement. Dr. Stanley Darrow, her excellent choice, became my dentist and eventually my cherished friend for over 25 years. I had been toying with the idea of finding a dentist closer to where I now live when Dr. Darrow retired though I fully intended to continue going to the wonderful technician Georgia Klamson. Sadly, a week ago today, Dr. Darrow passed away. He had been ill for several months, during which time I chanced to meet Dr. Kellen Mori, one of the members of his dental practice, while having my bi-annual prophylaxis (tooth cleaning--I always giggled when my mother called it by its technical name.) It took all of three seconds to decide that she would be my next dentist. 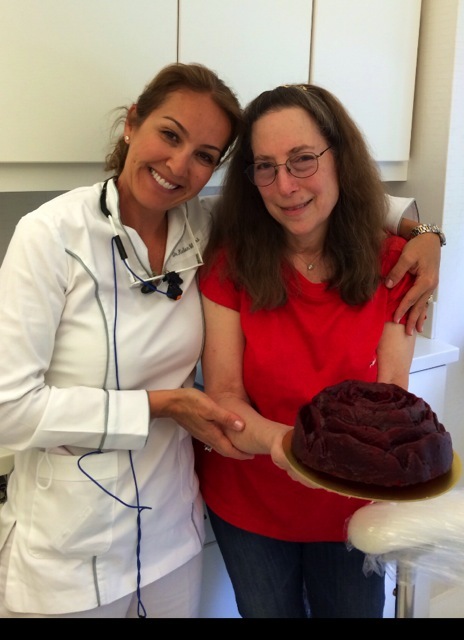 Dr. Mori told me that she loves to bake and that her favorite cake is the red velvet. So for my first appointment I made her this cake from my upcoming Baking Bible. I feel once again in skilled hands and heart I trust. And I'm certain my mother would have approved. There's a New Widget on the Blog!